Call me a CrackBerry Addict but last night's leaked photos of a BlackBerry Slider device had me too excited to sleep. Big leaks like this historically get followed by a flood of info into the good 'ole CrackBerry tipline, so between what we knew in the past, what has surfaced recently (BGR posted some details last week) and what's come in that we trust since the photos went live, I figured I'd walk through some Rumor Q&A to set the record straight to the best of our knowledge at this time. Let's get it on! Q. Are the leaked photos of the BlackBerry Slider device legit? A. Yup. Though I initially had some doubt that this device was the most up to date design RIM has been working on for their vertical slider we've now had several confirmations that this is it. And if this somehow isn't final form it's at least dang close to it. That is assuming of course that RIM proceeds as planned still despite the initial reactions a lot of people are having to the leaked photos. Q. Is the slider the BlackBerry Storm3? A. NO. This is not the rumored BlackBerry Storm3. And it likely is not a Storm at all but more likely will fall into another product family. The original codename for the BlackBerry slider was actually talledega (mr. t for short). Going back to my notes on talledega when we first heard about it over the summer, it was clear that this device would be GSM which means an AT&T/Rogers et al thing and not Verizon. Long ago we'd heard rumors that Verizon had agreements in place with RIM for at least some exclusivity to the Storm/SurePress name and technology, so it adds to the reasoning that this will not be marketed as a Storm. Q. If not a Storm, then what is it? A. A few things lead me to believe it's more likely the slider berry will hit the market as part of the BlackBerry Bold line. For one, the keyboard shares the same "guitar frets" that the Bold 9000 and 9700 do. That's a Bold signature, just as spaces between the keys are a Curve signature and SurePress has been a Storm signature. Secondly, we've been watching our site analytics and also checking out some App World reports (developers can see who's downloading their apps and what device and OS they are running) and have noticed the odd 9700a pop up. We had heard a little while ago that the vertical slider early hardware was carrying 9700a on the about screen so have been watching out for it and sure it enough, we have seen it a couple times now. 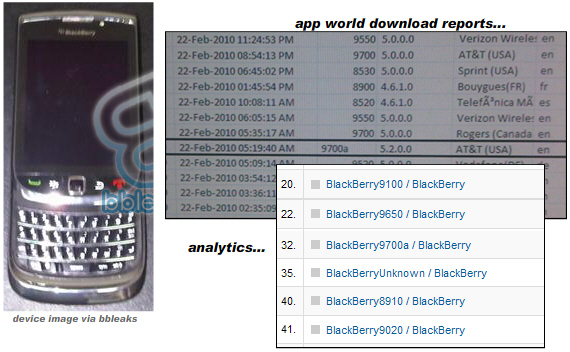 Note that the download report pictured above from App World shows OS5.2, but that the device will ultimately launch with 6.0. There isn't a 5.3/5.4/5.5 working it's way into 6.0, so it's most likely that particular unit was not running the latest software builds, with 5.2 not yet re-branded to 6.0, which the latest devices/builds supposedly have. So in other words, 5.2 = 6.0. And obviously the 9700a device model is temporary and will get changed up to something else as it nears the market - likely the 9800. Last point here.... the Storm has a bad reputation. The Bold has a great one. If you're launching a new device in a new form factor on a carrier that has never sold the Storm before, which name would you rather go with? I'll bet somebody a year's worth of Campari that the slider won't be a member of the Storm family, and with it having more Bold details than Curve details... it only makes sense that it's a Bold (and with RIM scrapping the Tour name on the 9650 to consolidate brand families it just wouldn't make sense for them to introduce a new line). Any takers? Q. Does the Slider have SurePress? A. No. This device does not have SurePress, but features a fixed piece of touchscreen glass (aka iPhone style). And resolution (as previously stated by BGR) is at 360 by 480 pixels... same as the current Storm. Q. What OS will it launch with? A. As stated above and as also mentioned by BGR, it'll launch with OS 6.0. A. Je ne sais pas. My guess would be sometime in the summer. If you check out the Analytics report above, it's pretty funny to see the unreleased devices that cruise the site. RIM still has a Pearl 3G to push out, not to mention a Tour2 (now Bold). And oh yeah, let's not forget the atlas (Curve 8910). The dakota has been rumored for a while now, but we're not seeing that on the analytics at all yet so maybe this slider is next in the pipeline. With people LOVING the Bold 9700 as it is, it makes more sense financially/market-wise I think for RIM to put this out first and appeal to a different user vs. adding a touchscreen to the standard 9700 form factor. One interesting point to make is that the App World download in the photo above with the 9700a came from AT&T, which means the slider is likely at a point now where partners (carriers) are getting it to do some testing, vs. it still being in the early development (waterloo) stages. CTIA and WES are coming.... so hopefully we'll start seeing some device announcements soon. THINGS WE'D NOW LIKE TO KNOW... When the photos leaked it was stated that some more photos and maybe even a video would be on the way, so hopefully we'll have some more clarification to all of this soon. In the meantime, going off the 9700a theory as above it introduces some interesting things to ponder on. With the look of the device being current generation styling (very much a Storm and Bold slammed together) and knowing it's GSM, it becomes likely that this device is running the same processor as the Bold 9700. Will it get a memory boost above the 256megs we see in the current devices or will it stay the same? Right now it's only the Storm2 and Curve 8530 that support OpenGL - no GSM BlackBerry does. Will this be the first GSM BlackBerry to support OpenGL or ??? If not, that seems like a real shame as this type of form factor has more of a consumer (gaming) appeal. So that's where I'm at on the rumormill front as of right now. And keep in mind I've been wrong before and will probably be wrong again. But you know I just have to share where my mind is at on these things with everybody. Take from it what you will. Let's see how it pans out. As always, sound off in the comments and let us know what you think!